I finally got my drum set about a week ago! I knew i'd love it but I'm addicted now. I have a question about hi hat spacing. I've messed around with it but just cant seem to find the right gap. Do any of you have any suggestions or tips? what exactly do you mean, where the HH is in relation to the snare/toms ect or how much space should there be between the two cymbals of the HH? I have a small gap.. 1/2"
Last edited by SpazApproved; 03-27-2015 at 08:05 AM. My hhts have a 1 inch gap between them open. This way you have an inch play when opening and closing the hats. Also my top hat is kind of lose just like a cymbal on your stand. Hope this helps and experiment is the key. 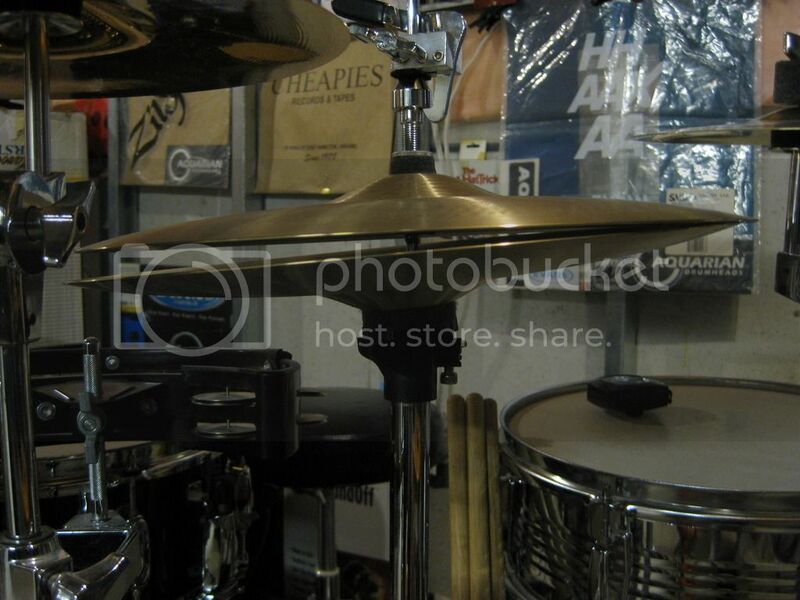 I mean the spacing in between the top and bottom hi hat. ...and thank you for the warm welcome. Like I said I can already tell I'm going to love it here! Some guys like lots. I prefer a short travel. 1/2 to 3/4 inch. Something like that. I like a small gap like 1/2 an inch. That way when I play an open hat groove I dont have to think about holding my foot in a certain position. yea, as pearl said, just experiment with it, sometimes you'll want a lot of room to play with, sometimes not. Also depends on your skill level, if you're just starting you might not have a good feel for how much you should put your foot down on it to get the sound you want. Also depends on the type of music you want to play, how much you use your LF ect ect...hence just play with it and have fun! I have a really small gap. I like a lot of sizzle when I do my "pea-shups." Plus with the music that I'm playing these days, I don't have any need to have my hats sloshing around a whole lot. As you can see, it's all up to personal preference. Find the position you like for the sound you want, and roll with it. Drums are like anything else. Clear or coated heads, single or two ply. Bright or dark for your cymbals. Flat or angled toms. Wood or steel snare. There are many options for everyone to be able to set up their kits just the way they want. I'd never thought about the space between my HH cymbals, so I just measured it. 1-1/2 to 1-3/4." I use my HH a lot as the timekeeper when I play, and I like them to be loud and prominent. I must say, though, that if I'm in a situation where the volume must be lower, I narrow that gap to back off on the HH volume. And welcome aboard. I'm a newbie, too, and DC is my go-to drum site. Very good people here. They are called pies for a reason. 3.1416 cm. No more no less. I think we might have given a bit of info overload to a beginner, it's like if a 7 year old asked a bunch of philosophers about the meaning of life! I prefer barely open. I don't do much work on the hat pedal. Welcome to Drum Chat! Depending on how much tilt is on your hats, you will get a small and a larger. My gap is 3/4" at the larger side. About 1/2 inch gap for me. Yeah I have to pace myself on all the info But I'll take all the help and info i can get! Probably about 1/2 to 3/4 in.............never really measured, but I know what feels right. This....most important, if you tilt. If not then make it so your hat foot doesn't fatigue keeping it open too far. I stomp my hats' pedal(heel up) so I keep them either open to maximum space or loosen the clutch and leave them closed. My left foot still pumps the pedal when the hats are closed with a loose clutch. I'd like to go 3/4" wide, but slanted using the hihat adjustment. Slanting the hats gives them a sweet crisp sizzle that every hihat should have. Until reading this thread I was unaware that you could adjust the Hi-Hat slant... Now that I know I can, I'm not sure why I'd want to. I like to have a huge gap, I go about 1+1/2 to 2 inches I prefer to adjust my foot for the sound I'm looking for, I rarely open it all the way. 1" gap tilted, and x hats a few millimeters for a sizzle sound. I don't sizzle with my mains. around an inch space for me. Bottom flat. I use the pedal a lot and sometimes need to readjust and readjust again to get just the right feel I'm use to. 14" Z Custom top with 14" AAX Stage bottom. The last trace of Sabian used on my set up.